Are you helping organise the Chelsea or Hampton Court Flower Show? Taking along some corporate clients? Looking to hire a live jazz band? Check out the Mississippi Swamp Dogs “alter ego”, Dan Darling and his Lovely Chaps. 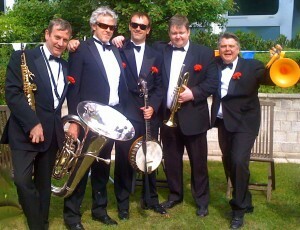 A superb “Great Gatsby” style jazz band, a perfect foil for a Flower Show event. An acoustic Vintage Jazz band, all professional musicians, with tons of experience performing for high end events. Our clients include BP, Canon, Granada TV, BBC TV, ITV, The Evening Standard, The QE2 Cruise Ship, Goldman Sachs, Threadneedle Street Asset Management and many more. Here is the band performing, in a garden of course (what could be more apt?) as a five piece version of the group. Totally acoustic and totally live. No mics, no amps. This makes them incredibly flexible and able to move around a site at a moments notice. 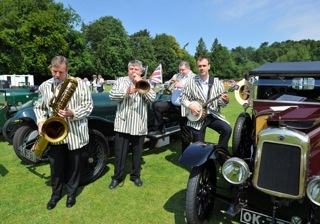 More information here: Jazz band hire Oxford, Jazz Band hire Kent, Jazz band hire Brighton, Chelsea and Hampton Court flower Show Jazz Band, Jazz band London, Speakeasy Jazz Band hire , Party Band Hire, Prohibition Jazz Band Hire, 1920’s Jazz Band Hire London, Jazz Band Hire Cotswolds, Jazz Band Surrey Hire and London Jazz Band Hire , Great Gatsby Jazz Band Hire too.